Devarim -- book of tokhachah/invigoration(lashon Koach)/rebuke -- and this is aspect of the Proper Rebuker a la Likutei Moharan II: 8, i.e. the Proper Rebuker i.e. the Moshe Rabeinu of the era who needs the voice of the river which becomes four heads (Gen. 2) i.e. Na Nach Nachma Nachman (MeUman), aspect of Y YH YHW YHWH (=72) the song that will be awoken in the future when Hashem Yitbarach renews his world in chesed (=72) i.e. the song that will be played on 72 strings (Tikunei Zohar #21 daf 51b) -- and this is " דִּבְרֵי חֲכָמִים, בְּנַחַת נִשְׁמָעִים--מִזַּעֲקַת מוֹשֵׁל, בַּכְּסִילִים. Eccl. 9:17 The words of the wise spoken in quiet are more acceptable than the cry of a ruler among fools." -- specifically in NACHAT/charm/grace, when the words have nachat -- then the words are heard (LM 1). And this is: "its end is fixed in its beginning" (Sefer Yetzirah 1, LM II 66-67) i.e. LM 1 (The first Torah in LM) and LM II:8 (Rabeinu z"l's last delivered Torah) are both on Nachat/Na Nach/rebuke/the true rebuker Moshe-Mashiach/voice of river flowing from Eden (like Adam said, "I heard Your voice and feared" (Gen. 2). -- where did he hear God's voice? -- in the sound of the river, as it says there, "And a river went forth from Eden" -- and this is "the voice of Hashem on the waters" (Ps. 29 etc. ), like the whole Chumash has beginning-to-end "Bereishit-Israel" (first and last words of the Chumash) (aspect of Israel Ber [Odesser] z"l; LM II 66-67)/ for the sake of Israel who are called Reishit/head/a la" קֹדֶשׁ יִשְׂרָאֵל לַיהוָה, רֵאשִׁית תְּבוּאָתֹה; כָּל-אֹכְלָיו יֶאְשָׁמוּ, רָעָה תָּבֹא אֲלֵיהֶם נְאֻם-יְהוָה. Jer 2:3 Israel is the Hashem's hallowed portion, His first-fruits of the increase; all that devour him shall be held guilty, evil shall come upon them, says Hashem." 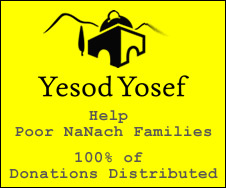 And via this may we merit to rebuilt Yerushalayim, Bayit Shelishi, v'sham nashir -- Na Nach! Two points, the first one being to hear G-ds voice. If you don't hear G-ds voice can you guard the mitsvahs? You hit the nail on the head brother!